Kids are quite often amused by toilets. It could be the water or the toilet shape but whatever it is, the toilet just seems to have everything right to attract a toddler to it, including being at the perfect height. The problem with this is that the toilets are very gross. Children might not have any idea what that is but the water inside and the purpose of the toilet make it a very dirty playground. Apart from this, a toilet is also a drowning hazard. Although a rare case, children can drown by falling headfirst inside the toilet and without any help, they simply run-out-of air. Because of this, it is important to baby proof your toilet by keeping the seat or lid closed using a toilet lock. This article gives you an in-depth review of some of the best toilet locks with a view of helping you get the best one for baby proofing your toilet. 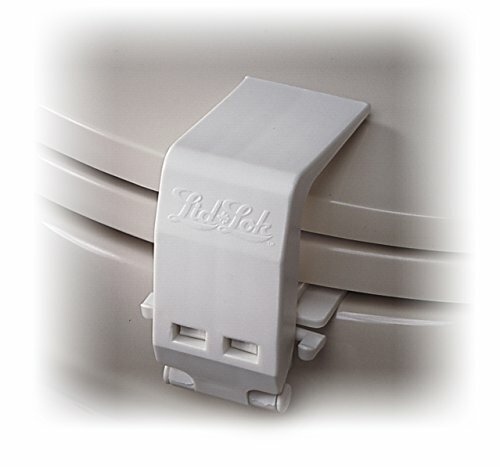 The Safety 1st swing lock is a strong plastic-made unit that has a universal design, which means it can fit and be used on most toilets. Some products might be difficult to install but this lock is fixed using an adhesive, eliminating the need for drilling the lid. This makes it the process quite easy. However, this adhesive should be left to dry so as to attach permanently. Therefore, you must ensure that the kids don’t play around with the lock before it sticks. If installed properly, the lid should lift not more than 1.5 inches, making it very safe for the youngsters. An important thing to note is that this lock is not recommended for use on soft or padded lids. You should only install it on hard lids. 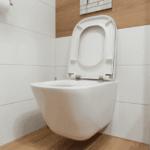 Universal design makes it ideal to use on most toilets. One hand locking operation makes it very sanitary. Recommended for use only on hard toilet lids or seats. Wonderkid’s child safety lock is available as either a 2 or a 6 pack and is very affordable if you consider the price per unit. It is also available in 4 colors, which include black, brown, white and white-silver. These color options help you get something that matches your bathroom’s decor. The unit has a universal fit due to its flexible strap, which means that the lock can be used on flat or cornered surfaces. 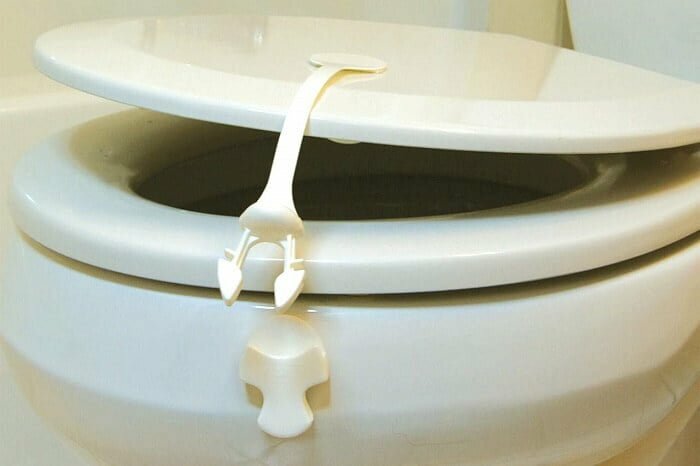 This strap is also adjustable lengthwise and this enables you to fit it correctly around the edge of the toilet and the lid. When it comes to installation, authentic 3M adhesive pads are used and this makes the setup process quite easy. However, the glue must be left to dry for at least 24 hours for permanent bonding. 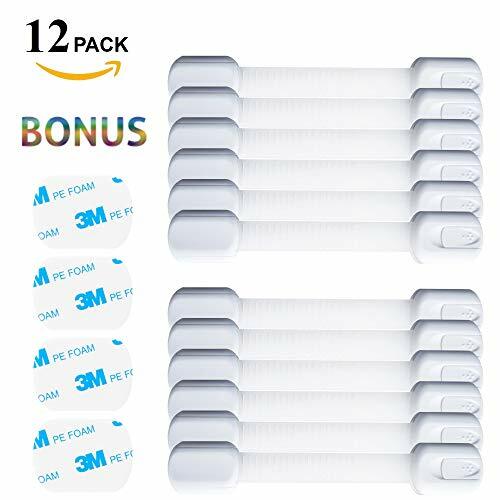 The pack comes with 2 extra pieces of 3M tape as accessories, which make the lock reusable in instances such as when you change the toilet lid. Flexible strap for installation on flat or cornered surfaces. Length adjustable strap for correct fitting of the lock. 3M adhesive pads for installation, which require at least 24 hours for permanent bonding. The set comes with 2 extra pieces of 3M tape that make the locks reusable. Structurally and functionally, BabyKeeps’ child safety lock is very similar to the Wonderkid’s unit above. It has a multi-purpose design as a result of its flexible and adjustable strap, which works on both flat and cornered surfaces. This means that you can use it on drawers, refrigerators, cabinets and of course, toilets. Additionally, the lock has a slim and stylish design that blends in easily on these different pieces of hardware while the availability in black, brown or white colors gives a more perfect fit in terms of color blending. Installation is done using 3M adhesive strips, which are known for providing superior stickiness, and comes with additional pieces for helping you reuse the toilet lock. The product comes in a set of 6, giving you enough pieces to baby proof the toilet many other things in your house. Flexible and adjustable straps make the lock usable on both flat and cornered surfaces. Available in black, brown and white colors. 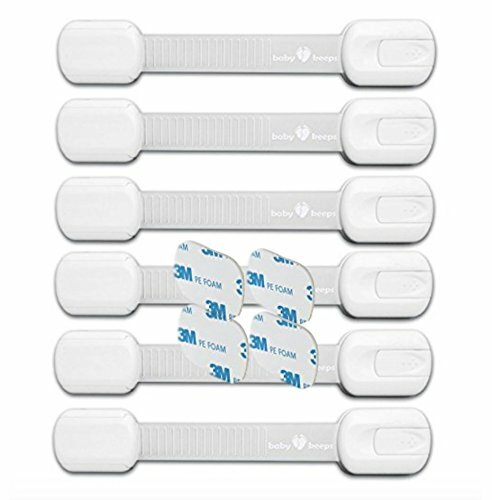 3M adhesive strips for easy installation and reusability. Comes as a set of 6 locks. Cutesafety’s toilet lock is a top rated product and this can be mostly attributed to its durability. For starters, the unit is made using a high-quality ABS and TPE plastic material, which is non-toxic, flexible and durable. Secondly, the lock is attached to the toilet using 3M adhesives, which form a very strong bond that can withstand the pulling action caused by children trying to open the toilet lid. This also means that it is easy to install because no drilling is required. The flexible and adhesive installation properties make Cutesafety’s lock very versatile because it can be used to baby proof various equipment such as cabinets, windows, cupboards, and refrigerators among many others. Made using high-quality and durable ABS and TPE plastic. Easy to install using 3M adhesives. One hand locking and unlocking operation. Comes as a pack of 6. 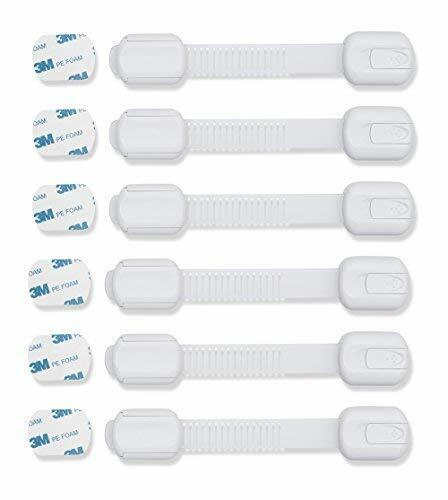 3M is a big deal when it comes to toilet lock adhesives. This child safety lock features 3M adhesive pads that bond strongly to the surface while also making the installation process quite easy without causing any damage to your toilet. The strap that holds the lock together has a high tensile strength that is capable of withstanding the stress caused by your child in trying to open the toilet lid. This strap is adjustable and this makes it quite easy to fit across different toilets and their lids. For unlocking, an innovative double-finger press design is used. This design is very intuitive for adults but kids cannot figure it out. An important thing to note, however, is that this lock is only usable cornered surfaces, which means that after installing it on the toilet, the remaining 5 locks in the 6-pack can only be used to lock fridges, cabinets etc. on their cornered edges. Double-finger press design for unlocking. Usable on cornered surfaces only. 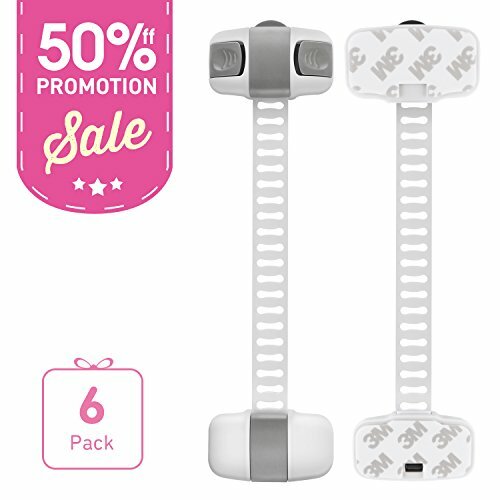 The biggest strength of Younik’s baby safety lock is a very tough and durable PE strap that can bear up to 21 kilos of force, which is pretty huge. It is very hard for small kids to achieve such and therefore, this ensures that they are permanently locked out. 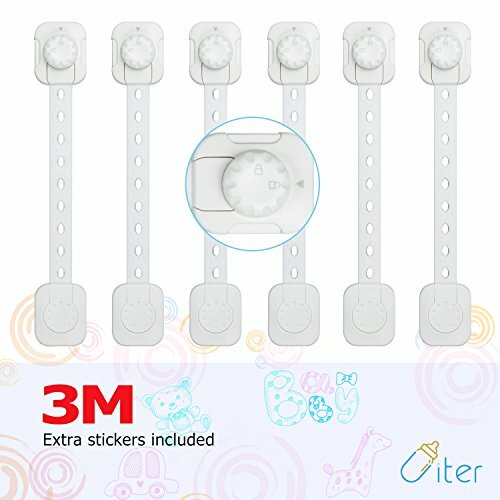 To give more support, 3M adhesive is used to attach the lock to the toilet or any other item that you want to baby proof in your house. However, you must give the glue at least 24 hours for it set strongly. A double lock system is used to keep the children out and this gives you more confidence in the lock’s abilities. The first lock is closed or opened using a rotating switch while the second one is a pressure switch that must be pressed on both sides of the lock. Tough and durable PE strap. Easy to install using 3M adhesive pads. 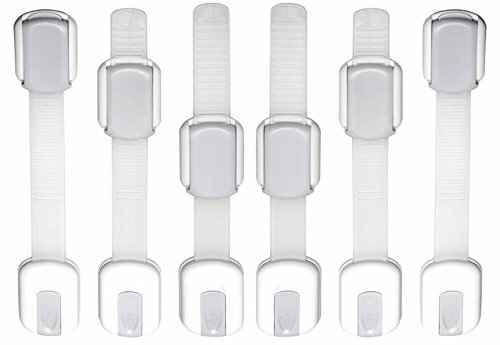 If you want to baby proof a lot of stuff, this is the best option to buy because it comes as a pack of 12 locks. Although expensive as a set, the price per unit is very affordable, which makes it a big bargain. With this 12 pieces, you obviously need a place to use them apart from the toilet. Luckily, this safety lock is a multi-purpose product due to its strap and latch design, which makes it ideal for refrigerators, drawers, cabinets etc. Design wise, the locks have a strong and slim look with an adjustable strap lengthwise that makes it more versatile to use. 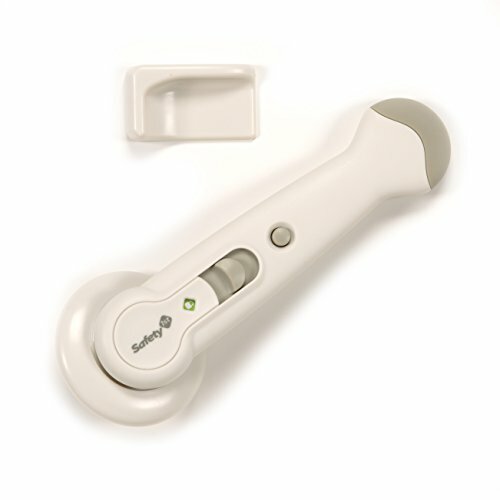 Other features include 3M adhesive tape for easy installation and easy to open latches for adults but hard for children. Comes as a pack of 12. This is the most affordable toilet lock but it has a somewhat complicated installation process as compared the other adhesive-based toilet locks above. 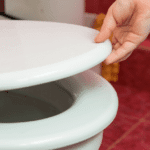 In order to work, the supporting base of the unit must be fastened onto the toilet bowl. 4 spacers are included to help with this and they give the lock a universal property because it can be fitted onto most toilets, regardless of their size. 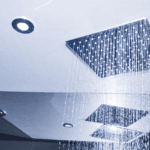 Once fitted, an L shaped bracket does the locking and is operated using only using a single hand to unlock for ease of use as well as for sanitary purposes. The good thing about it is that it can be used immediately after installation. 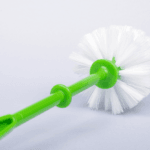 However, it is only designed for toilet use and has a complex design that requires regular cleaning because part of the clamping goes under the inner rim. Can be used immediately after installation. Comes with 4 spacers for universal fitting. One hand lock and unlock operation. These two characteristics are very important factors to consider. A toilet lock that is flexible and adjustable is versatile enough to be a multi-purpose lock. Such a lock will be ideal to baby proof a couple of places such as refrigerators, cabinets, drawers and of course, toilets. However, most rigid toilet locks are specifically designed for toilet use. Therefore, if you want to buy a set of locks, make sure that they are meant for multi-purpose use so that you can utilize them in different areas around the home. 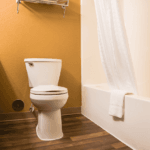 When it comes to installation, there are two main ways of installing toilet locks. The easiest method is by using strong adhesive but this takes a lot of time, at least a day for the glue to set properly. Toilet locks that feature clamps for installation are a bit complex to install but they do not require any drying time. They can be used immediately after installation. Quantity should be considered if you intend to buy a full set for baby proofing the entire lockable stuff in the house. For instance, if you want to lock your toilet, fridge, cabinets, and drawers, you can buy a set containing a couple of units to cover all these. However, you should ensure that they are multi-purpose units. If you only want to baby proof the toilet, you should go for the single unit. Not all toilet locks come with accessories. However, for adhesive based locks, some do come with additional tape for reusability purposes. Such accessories are usually very good to have. In fact, additional accessories are always an added plus and make the deal sweeter. If you were wondering about how to get the best toilet lock, this article will greatly assist you to narrow down your options. If you also did not know about the importance of toilet locks, after going through this, you will have a much better understanding of this. Simply said, this tool is not something to forego, especially if you have a toddler(s) in the house.